As an adoptive parent I think that Mother's Day comes with a lot of extra emotional stuff. As much as I want my kids to just think of me as Mama and as much as I love them just as if I had given birth to them, the reality is I am not their first mother. Heck, I'm not even their second mother. They all have a birth family out there in the world somewhere, missing them and grieving for them. I never intended to be a mother. If you've known me or read this blog for very long you know that Brian and I had planned to not have kids of our own. We were both teachers, we had 100 kids a day, that was enough for us. We came to the unexpected decision to adopt in 2005 and Grace came home in January 2008. Suddenly I had a new holiday to celebrate. 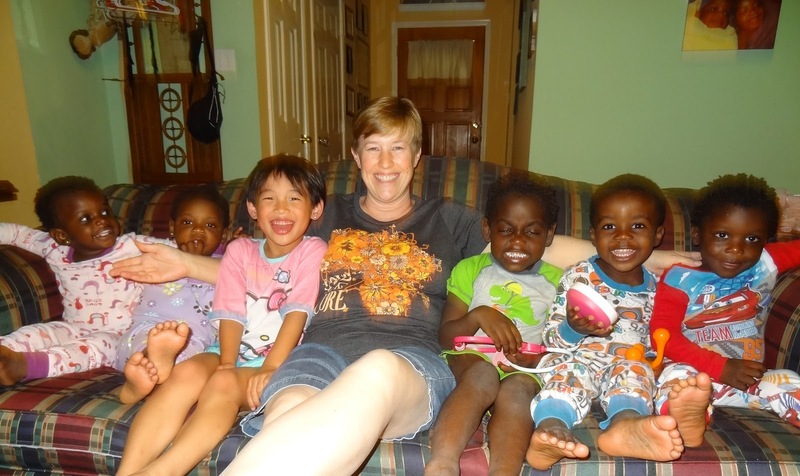 Mother's Day 2012--the day we arrived home from DRC--scroll to the bottom for this year's pic! Surely Mother's Day feels a little bit different if you're a mother through adoption. It's not just my day. I share it with several birth mothers, some living some dead, and a foster mother. Sadly my day of joy and celebration comes at the expense and loss of these other women. I've been thinking about my kid's birth mother's a lot the last few days. Two of them we know are deceased. Four of them are probably not. All them were brave. My children are mine because of a series of terrible and tragic events. Why were my children given up? I don't know. But I do know that all six of my children were loved enough to be delivered into this world and into my arms. They could have been aborted. They could have been left to die. They could have spent several years in an orphanage before aging out and moving to the streets. They could have been statistics, but instead they are treasured gifts. So on Mother's Day I am beyond thankful to all the women who saved their children and gave them a chance to be part of my family. I am also eternally grateful to the extraordinary foster mother who cared for my kids in Congo. I know without a doubt she loved them like her own, nursed them back to health through some serious illnesses (all five of my kids from DR Congoi have had malaria), and mourned their loss when they had to leave her care. Last year Mother's Day became extra special because it was the day we arrived home from DRC with Katriel and Louise. So this year's Mother's Day was also the first anniversary of being a mother of six. SIX. Holy Moley! It was a sweet and gentle day. I got gifts and my favorite meal. But most important, I got to spend hours holding and kissing and laughing with my amazing kids. Mother's Day used to be just another Sunday. Wow! Not any more!